Celebrity Extra: Nathan Fillion Brings Castle Back on Monday! Nathan Fillion Brings Castle Back on Monday! Celebrity Extra: At the end of last season, Castle found out something about Det. Beckett’s mother’s murder. What can you tell me about what he finds out? Nathan Fillion: In the first episodes, you’re going to see that he has found something out and it’s important and it’s poignant. The problem is, he’s really crossed the line. At the end of the last season, he did something that he was told unequivocally, "Do not do this." This is one of his flaws; he doesn’t know when to quit. She said, "Don’t cross this line," and he willingly and willfully crossed it. It is definitely going to drive a wedge between them. CE: I love that they have created a Richard Castle-written book, Heat Wave (which will be released on Sept. 29), as a tie-in book to the show. What's the book like? NF: It’s exactly the kind of book that you’d expect Richard Castle to write based on his experiences with Det. Beckett. He is borrowing real-life experience from Castle’s real life – you’ll see lines that were said on the TV show appear in the book. You can see the tie-ins from Castle’s real life to the book. It’s really clever. It’s a great idea. We are going to go out and do some book signings. 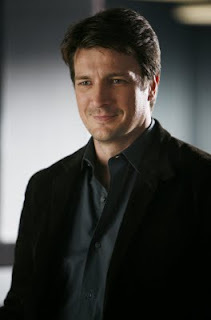 CE: Will you sign as Richard Castle or Nathan Fillion? NF: Hey, if someone wants me to sign it "Richard Castle," if they want me to be a fake dude, that’s fine, I can do that. However, the "Nathan Fillion" autograph is the one I’ve practiced since high school. CE: One thing that sets this show apart from others of its genre, for me, is the cast. What is it like working with the Castle cast? NF: We’re just finishing off an episode today where I get to work a lot more with Ryan and Esposito, played by Seamus Dever and Jon Huertas. When we go to rehearsal, I love it, because the guys have always worked something out – a little bit that they’ll do. They always put personality into whatever they are doing. They always have a bit of a history, like they’ve come from someplace. Something always reflects in the history of their relationship. It’s always a pleasure to watch. I always call them my Rosencrantz and my Guildenstern. Were I Hamlet, they would be my Rosencrantz and Guildenstern. CE: I also love Susan Sullivan, who plays your mom on the show. She is hilarious! NF: She’s a real hoot. She's an actress who comes to work with incredible life built into her character. If you see her in only one scene an episode, you still have a sense that she’s come from somewhere, and then she’s off to do her thing. She has a life elsewhere, and she’s busy and active, and her life doesn’t center on what we see. I just love her energy and her comedic intelligence. Her instincts are amazing to watch. It’s almost distracting. I catch myself being an audience member rather than a participant at times. Much the same with Molly (Quinn, who plays Alexis Castle). She’s so well cast. She truly is intelligent beyond her years. She seems so much more clever than girls her age. I have to keep reminding myself that she is 15 years old. She is well adjusted and well socialized – I tell that to her parents all the time. CE: Here's a question on the minds of many of my readers. Will there be a sequel to Dr. Horrible's Sing-A-Long Blog, and will you be involved? NF: There are plans for another Dr. Horrible, and Capt. Hammer will be involved. CE: Are you surprised that what started out as an underground, in-the-know kind of project has become such a cult phenomenon? NF: I’m not surprised that it has become so popular and so well liked. That’s Joss Whedon for you. He’s got something going on. Whatever he touches seems to turn to gold in one way or another – if not with mainstream success, then with culture status. That’s his gift; he tells stories that people yearn for. There’s nothing I like more than getting involved in a Joss Whedon project and taking credit for all his hard work. Don't forget to catch the season two premiere of Castle on ABC at 10 p.m. on Monday, Sept. 21 (following the two-hour season premiere of Dancing With the Stars). You can buy season one of Castle at your local retail outlet on Tuesday, Sept. 22. Yay, Castle premiere tonight! I'm so looking forawrd to more Nathan!! He seems like he has a blast and a half doing that role.